Burt Reynolds passed away Thursday at a Florida hospital after going into cardiac arrest. He was 82. In honor of one of the greatest actors ever, we took a look back and found his top 10 movies of all time. Born in Lansing, Michigan in 1936, Reynolds got his first big break on in the entertainment business when he got a part as Quint on the hit television series “Gunsmoke” from 1962–1965. But it was his part as Lewis Medlock in the 1972 action film “Deliverance” that launched him into worldwide celebrity status. The rest, as they say, is history. Picking just 10 of his best movies with a career spanning sixty years proved to be challenging. But taking a look at his Rotten Tomatoes scores plus a handful of our own favorites, we came up with this list. Of course, his part as Bandit in the 1977 classic buddy film “Smokey and the Bandit” alongside Sally Fields and Jerry Reed made the cut. But check out the list to see if your favorites also were one of the top 10 movies selected. So, sit back, relax and enjoy this ride through these classic Reynolds’ movies with the legend who will definitely be missed. While it’s always tricky trying to make everyone happy, we are pretty sure even the biggest fans would have to agree that these go down as classic movie moments. 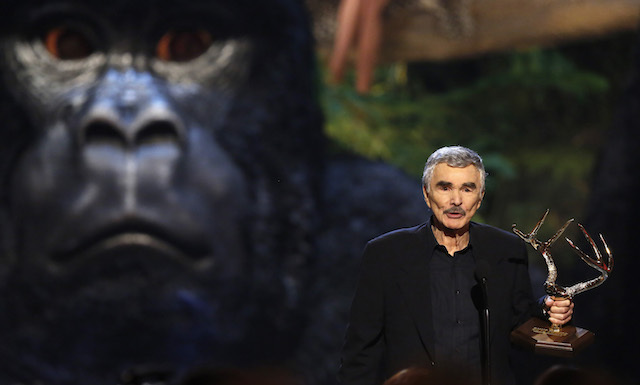 Thanks, Burt, for the wonderful memories!